Victoria Court has a dream. That dream is to transport its guests to a different reality from the time one drives into the properties until they check out. Victoria Court has a vision. That vision is to be the perfect host and delight guests every time, every stay. Having these challenges in mind, the team has come up with #TheVCExperience – a campaign aimed at informing guests of the distinction that comes with staying at Victoria Court. 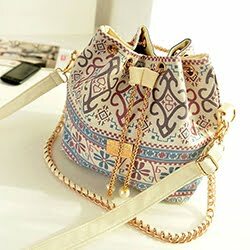 What makes Victoria Court unique? What sets Victoria Court apart from its competitors? 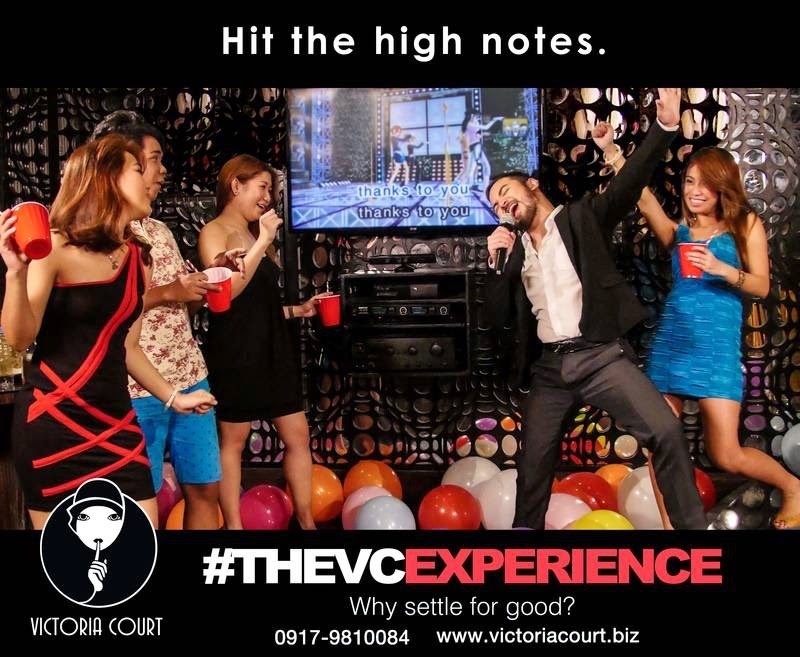 It is #TheVCExperience. #TheVCexperience showcases everything you can possibly do at Victoria Court. Victoria Court’s goal is to own milestones. From Anniversaries to thematic debuts, they offer the experience customized and catered just for you. Being known for having Superthematic Suites that cater to one’s fantasy date or perfect thematic party, why not party in costume or character. Choose who you want to be for your birthday or stag party. If you want to be the President of the United States for a day, try the Oval Office at Victoria Court Pasig. 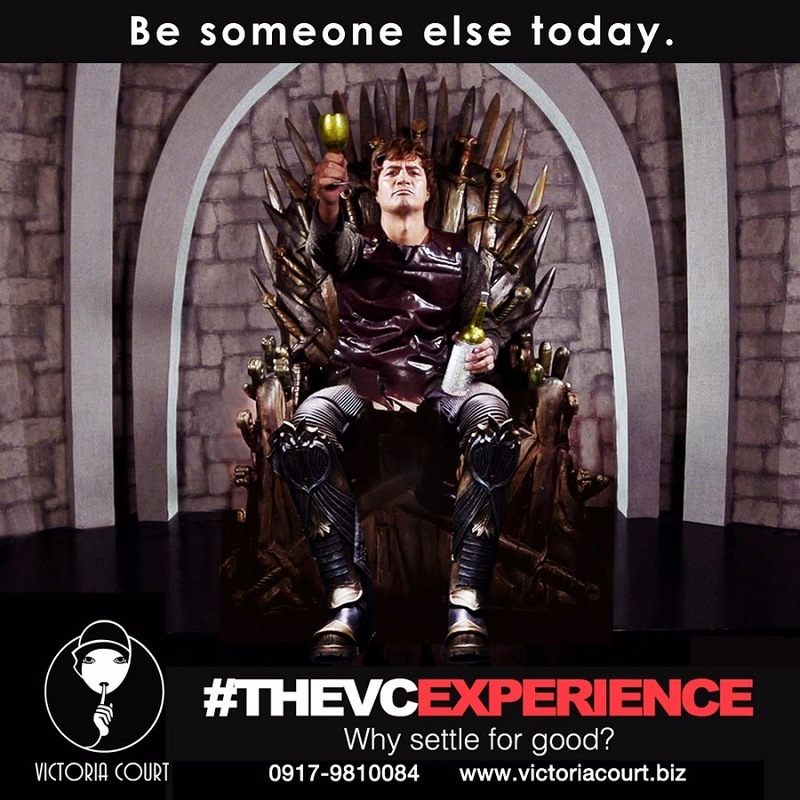 Addicted to game of thrones, choose your Kingdom and win the Throne at Victoria Court Cuneta. So many themes to choose from – Be Someone Else today. Wanting that perfect place for a proposal? Choose from Victoria Court’s destination suites. Santorini, Maldives, Sedona, Bali, whatever backdrop you wish, they can provide. 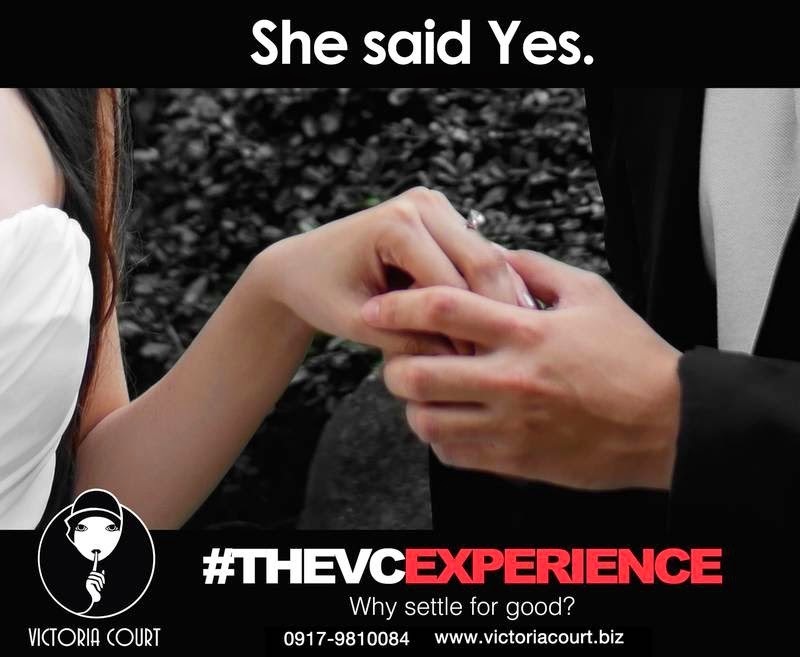 Victoria Court will do everything it can to make her say YES. Share with the world how She said Yes. Dance like no one is watching or try to hit those high notes, in the privacy of your own suite with only your friends to see and hear. Party Beyond Ordinary is Victoria Court’s promise. Relax and put your feet up. Victoria Court’s amenities include Jacuzzis and intimate tubs where you can just forget the world, even just for awhile. Enjoy the LED Flat Screen TVs and surround sound system and cheer for your favorite Ms. Universe candidate and scream as loud as you can when she wins. This 2015, Victoria Court will be coming up with more themes and packages experiences to tickle your fancy. Victoria Court’s dream is to give you the perfect experience for that once in a lifetime milestone. Victoria Court’s vision is to be THE perfect host at that perfect moment. Find your Sweet escape, Party Beyond Ordinary, Feel the distinction and let Victoria Court share with you #TheVCExperience. For inquiries and reservations, please call us at 0917-9810084. Follow @victoriacourtvc on Twitter and Instagram and like our Facebook Fan page facebook.com/VictoriaCourtph or check our website at www.victoriacourt.biz for new promos and events.